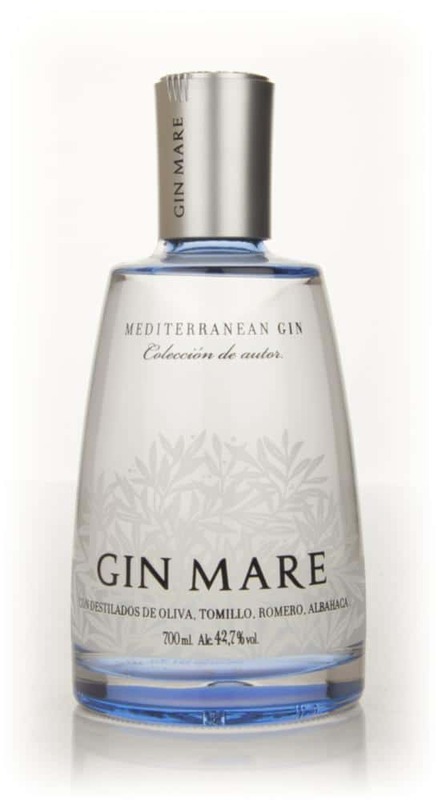 Gin Mare is inspired by the culinary heritage of the Catalon Mediterranean region. It’s origins are set in a once-small fishing port of Vilanova i la Geltrú. Gin Mare is pot distilled in an old chapel. Though the signature botanical is the local Arbequina olive, it’s the citrus element of Gin Mare that is the most extraordinary. The peels of both bitter and sweet orange and regionally grown lemons are macerated for a year in neutral spirit before distillation. The other botanicals are macerated and distilled separately all of the aforementioned are blended to produce the final Gin Mare product. Gin Mare smells mild and clean with rosemary immediately present. Herbal, but not too overpowering. A bit of juniper too. A good contemporary nose, I can tell its gin, but its clearly flashing some of its novel notes. The taste is pleasing, initially vegetal but smooth throughout. I’ve had a couple of gins with a strong herbal profile that quickly descend into “broth” or “soup,” this remains clear. A bit of rosemary at the front, followed by some orange and juniper. The tail show a brief flash of increased warmth before trailing out with a lingering final note of Thyme. Thyme! My favorite herb. I’m loving this character here that reminds me more of cooking than it does of most spirits. Might this gin make a good accompaniment to a meal? Perhaps even an Italian pasta? Some basil in your gin to compliment the basil on your place? Mixing is a bit challenging I think. Thyme and lemon go naturally together [one of my favorite home made creations is Thyme lemonade], but that Thyme note doesn’t come out too strongly in a mixed cocktail. Its easily overpowered by citrus and strong flavors. So hold that lime before you put it in your gin and tonic. I think the best gin and tonic is an exceptionally clean one like Q here to allow the flavors and natural sweetness of Gin Mare to come through. Exceptionally smooth and makes a good martini, especially if you’re going to dial back on the vermouth a bit. It’s easily one of my favorite Martinis period. Herbs galore. Rosemary, Thyme and Basil are readily noticeable. But what you’re going to love about Gin Mare is its smoothness and the way that traditional gin flavors like juniper and citrus still shine. This is a unique and very enjoyable contemporary gin. I have had a bottle of Gin Mare on my shelf for six months now, because I find it too hard to drink neat and too difficult to mix in a gin and tonic. In Barcelona they serve it with 1724 Tonic, a mild tonic like the Q Tonic but a bit more herbal. It worked very well. Garnished with an olive and basil leaf. Thank you for the compliment. I’d love to find some 1724 Tonic stateside. I have heard very good things about it, and that it is an ideal pairing for some of these new contemporary Spanish gins. And what about Fever-Tree Mediterranean Tonic, with its hints of thyme and rosemary? Also, woud love to try it. It’s not for sale in the U.S. and very expensive to ship over. Have heard great things about it though! From my point of view with GT Mediterranean Tonic is too many herbaceous flavors on the G&T, better with standard FT or my fav with 1724 and a twist of orange + sprig of fresh rosemary / simply a basil leaf. @Michael Sperling have you tried Gin Mare on cocktails? it’s superb on a red snapper or in a dry / dirty martini if you like them. For the G&T use just the cap because its the perfect measure and avoid garnishes such the typical lemon squeeze that doesn’t work with Mare. Juan Carlos……I agree with your assessment regarding Fever Tree Mediterranean and G&T’s. A bit too herbal…prefer the Indian tonic as the go-to luxury. Gin Mare at this time is an absolute must-have in my personal stock. I think that in the new generation of gin is one of the most extreme but also the most successful with that unmistakable smell of brine of olives. not to be missed in a gin and tonic with a simple f.t. or a Schweppes Heritage garnished with an olive oil and a sprig of thyme. equally interesting using it in a red snapper always accompanied by a sprig of thyme. the best garnish for Mare I’ve had… a sliver of mango peel and cracked black pepper. Astonishingly good. And check out Brecon Botanical, made at the Penderyn distillery in Wales. The UK is where it’s at when it comes to gin !! I’m not a gin drinker – but on a recent trip to Bogota Colombia I ended up ordering a G&T made with Gin Mare after someone else in the group ordered one. I wish I had made note of the tonic brand, but clearly not your run of the mill tonic. In prep of the drink, the bartender used a good sized sprig of rosemary to rub the rim of the glass and to vigorously brush the inside of the glass. A slice of lime finished off the garnish. It was delicious and now I’m hoping to get my hands on some Gin Mare here in the U.S. I wish you did too! It wasn’t by chance 1724, was it? But that sounds fantastic. Gin Mare is hard to find, but it is around and well worth it! Put this together with a sprig of rosemary, Fever Tree tonic, a fresh slice of peach…or add light peach syrup, and you have yourself a delicious drink. Hi Wendy! never tried it with peach so will definetily do the next time. Thx for the tip! Try it with fever tree – a sliced cucumber with a potato peeler – make it wide (slice along its length as you would peel a potato) wrap it around the inside of a large red wine glass. Ice & 2x measures of gin mare & wait for it – some very faint shavings of a jalapeño on the top at the end…! Drink over the cucumber & wait for the zing…!! Better than a Bloody Mary for a hangover hair of the dog…!! !